Today I wanted to talk about what it means to feel like you accomplished something. For everyone that is completely different. If you are an overachiever getting one thing of your to do list per day might feel like a wasted day. Others may feel like that is the pace they have set for themselves and achieving one goal is a great day. It is all your perspective. Have you been hard on yourself throughout this challenge? Maybe you made too many goals that weren’t achievable during the time frame you had to work on them. Start to take a look back at all of the areas of your life you did improve in the last month and a half. In my own review of the challenge, initially I was disappointed because I had barely touched an area in my own home this whole time. Granted, I wasn’t physically in my home for a week because I was on vacation, but I also had to deal with a bought of vertigo for two weeks and an abnormally overloaded work schedule. Ultimately, I didn’t get to clean out every drawer and closet in my home, although I wish I had. Was that a complete fail? Absolutely not! I was able to improve small areas throughout the challenge, and those have the biggest impact. Getting through a pile of paper, cleaning up my car, sorting out my work bag or organizing my schedule are all daily tasks that keep me in order regardless of the challenge. Managing my time efficiently, cleaning out my emails and keeping up with the steady pace of communicating with all of you as much as I could were all amazing accomplishments. I didn’t have to get rid of physical items to get rid of bags of clutter in my head. The best accomplishment throughout this challenge was being able to motivate so many of you. I have run into many of you following this challenge around town and love hearing how participating has impacted you in a positive way. If that is not a great way to give back during Lent, I don’t know what is. So be kind to yourself. Know that you are working hard everyday to stay in order. Hopefully, you are more aware now of your habits. You have seen how small steps can make huge changes in your life and your home. Organizing is a daily practice. Make it your new daily habit and keep checking in with me when you feel stuck. I am always here to motivate and help. 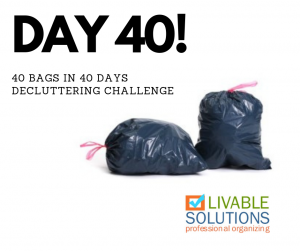 You can continue to follow my blog at https://www.livablesolutions.com/blog/ or at https://www.facebook.com/livablesolutions for continued tips and inspirational pieces. Stay in touch with me at kristin@livablesolutions.com. If you truly feel stuck, my colleagues Heather, Lindsay, and I are happy to come out and assess your space and give you even more tips or hands on help. Thank you for participating in this challenge with me.